Though FOX's Son of Zorn won't live to see a second season, if you were a fan of the series you might find this interview with its composer, Leo Birenberg, a fascinating read. 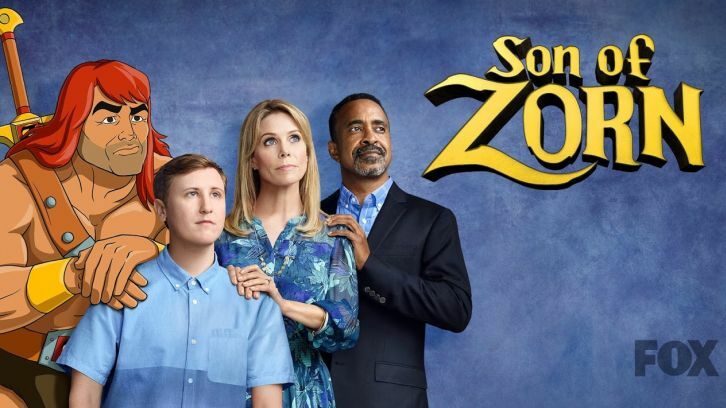 Son of Zorn brought back the live-action/CGI hybrid. Do you think we are going to see more shows like this going forward? What do you see the future of TV looking like? There’s actually a few networks and studios experimenting with live-action/animation hybrids right now. I think its appealing stuff. Right now we are confronted with so many questions about interacting with technology and artificial intelligence in our daily lives, that there’s just something that makes sense about telling stories that involve humans coexisting with cartoons. Zorn was at its core a story about the family dynamics and fatherhood, and I’m excited to see what other types of stories can be told. There was five different directors throughout the first season. Did each of them have their own musical notes for their episodes? And if so, was it hard to keep a cohesive tone throughout the season? Once shooting ended, the individual directors were no longer involved. But one of them, Eric Appel, was also an EP on the show and he was creatively in-charge all throughout post. So Eric and I worked very closely on each episode. We tried very hard to create a cohesive sound for the show-- there are lots of recurring themes that frequently pair with Zorn’s emotional states, and a palette of percussion, mallets, orchestra, and synths that find their way into every nook and cranny. Once we set up the sound and rules working on the first few episodes, it all came very naturally. Do you have a favorite scene from the season, musically, you can share with us? My favorite episode is “The War on Grafelnik.” Zorn wants to share his holiday traditions with Alan by celebrating Grafelnik, the Zephyrian revenge holiday. It seemed like an opportunity to do something special with the music, so we recorded a choir of both children and adults for a classic ‘Christmas Special’ sound. I wrote a few carols about Grafelnik and its history, which we then wove throughout the score for the episode, getting progressively more and more operatic. Narratively, it’s all very operatic as well, with every storyline coming together for this outrageous climax where Zorn sacks Santa’s Village in the local mall. Makes me feel like I’m watching a Mozart opera (Don Giovanni!). I loved the episode from the moment I read the script, and am so happy with how the music turned out. What kind of equipment, software and instruments do you rely on for your scoring work? And more specifically Son of Zorn? My main studio setup is four computers tethered together (one master and three “slaves” that run sample libraries in the background), which acts as the framework of a giant orchestral template I do my writing in within Cubase. But each project always involves its own additions as I come up with a palette. I am always collecting instruments-- woodwinds, drums, dulcimers, etc.-- so my studio is covered in musical knickknacks. I’m usually recording something, or noodling around until I come up with an idea. I also will frequently run Ableton Live in conjunction with Cubase, as it is specifically good at manipulating audio and automating various effects. With Zorn, I went for a palette that reflects Zorn’s foreign and barbaric roots: lots of drums, vocalizations, mallets that imply wood and stone materials. But all of that was then rolled into a more conventional rhythm section ensemble to make something that felt both familiar and accessible while made up of foreign components. From your unique perspective, where do you think the film and television industry is heading in the near future? Are there any new innovations that are in their infancy? In particular, what do you see as the biggest opportunities and obstacles you'll have to face as a composer? I’m excited to see how interactive things get. With VR coming into the mix, it feels like it’s only a matter of time before story telling techniques from video games are crossing over into film and television. With streaming television, the fact that we are no longer locked into such strict episode lengths means that a lot of new approaches to storytelling can be experimented with in the episodic model. But I think that as more shows are designed to be “binged” it may affect the composer’s approach. You don’t want episodes to sound too similar if they are being watched en masse. There are all sorts of psychological studies that restaurants use to determine how loud to play music and at what tempo to encourage people to order more-- I’m curious to see if that ends up directing composers to make similar considerations for bingeable television. Since you started out, what do you think are the biggest changes that the film and television industry has experienced from your point of view as a composer? Technology has been a huge game-changer for composer workflow, but that revolution really took place right before I came onto the scene. Right now the big changes we grapple with are the changes in medium as subscription streaming services are competing with traditional network, cable, and theatrical releases. It’s not the most exciting answer, but the shifting eyeballs are really changing how things are budgeted and scheduled, which affects what can be recorded, what tasks the composer is responsible for, and what the avenues of long-term income are. I’d love to see composers be a little more (read: a lot more) proactive in tackling these changes (Composers Guild of America, anyone? Call me.). To finish up, what are the most challenging, and the most rewarding parts of your job? The most rewarding for me is the world-building aspect of music. Some projects lend themselves to it more than others, but any time I feel like I am adding depth to the universe of the show/film through music, I am happiest. With Zorn, that was every episode; I had such a rich fantasy setting to draw from that was fleshed out just enough to give me a springboard from which to add to the mythology. I hope everything I do can aspire to that. Thanks for reading - I hope you enjoyed the interview. Huge thanks to Leo for taking the time to share his detailed answers with us. Let us know what you thought of the interview in the comments below.